Mix almonds, coconut and sugar in bowl. Add margarine and mix in until mixture is the consistency of damp sand. Press mixture onto the bottom and up the sides of 9” pie plate. Bake at 400 degrees for 6 to 8 minutes or until slightly golden. In a bowl combine sugar, vanilla and water; set aside. In a med largish saucepan bring coconut milk to a boil. Once coconut milk has come to a boil add cornstarch to sugar mixture and whisk until smooth and satiny. Stir into the boiling coconut milk. Cook for about 20 minutes over medium heat while stirring almost constantly with a wooden spoon. Filling should become very thick and creamy. 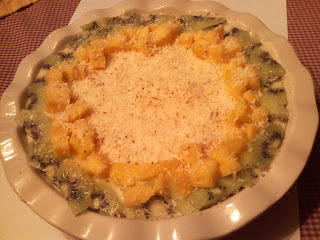 When done remove from heat and mix in pineapple and non-toasted coconut, pour into prepared crust. Refrigerate for at least 2 hours. The longer it chills the better. Garnish if desired with mango, kiwi and toasted coconut. To toast coconut- add to dry skillet over medium heat moving coconut constantly ..should only take a minute or too. Due to fat content coconut will continue to cook when removed from heat so be careful not to burn.